An active donkey is a happy donkey! Do you need a challenge? 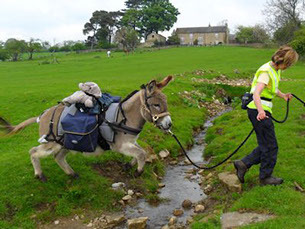 – Do you and your donkey need/enjoy plenty of exercise? Would you like to raise money for a charity? – Do you get bored? Donkeys mostly love to be ‘involved’ with you, whether learning good behaviour, going for walks, being ridden or driven; and most owners love to receive compliments about their donkeys when they are seen in public such as when being shown in donkey classes, undertaking domestic tasks such as carrying the recycling in panniers to the recycling banks, and even trekking or ploughing and harrowing. Many of these activities need planning, and the winter months are an ideal time for preparation, whether completing entry forms for showing , planning a route for trekking, contemplating activities in the warmer weather within the Active Donkey Award (ADA) scheme, or thinking about raising money for your favourite charity by taking part in sponsored events. Whatever your choice, do enjoy your donkeys. 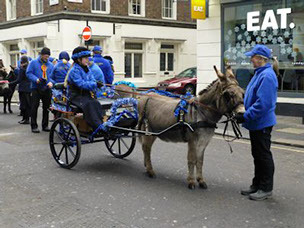 This scheme was set up to reward riders with a lovely rosette for every 25 hours that they accrue riding their donkey. It is open to adults and children alike. Every time the donkey is ridden, the rider logs it on a log sheet, and as soon as they have got to 25 hours, they send me their log sheet and I send them their rosette. The riding can be hacking, lessons, in the show ring, gymkhana games, fun rides, delivering cards or newsletters, picnic rides, anything! At the moment we have three adults on the scheme and four juniors. One junior, Jessica has reached her 250 hours and is well on the way to 275. There is also a special prize for any donkey reaching 500 hours, whether or not with the same rider. Harry is well on his way to 500! Anyone wanting to join will need to send a cheque/BACS payment for £2 to Carol Morse. She will then inform me, and I will send the logbook by e-mail (preferably) or post. As soon as 25 hours are reached then the log book is returned to me. I will send it back with the rosette. When 50 hours have been reached you will need to send Carol another £2, and so on every 50 hours.